Send Bulk SMS Software – Professional send group text messages from personal computer to end user mobile phone via USB modems, GSM, Android, Windows OS based mobile devices. Text messaging program allows you to stay in touch with your clients, office workers or family members located globally by sending messages related to business meetings, market news, seasonal greetings, emergency alerts etc. Mobile messaging program provide option to send bulk text messages contains non-English (Unicode) characters. Software is also having "Exclusion List Wizard Option" to maintain the Lists of contacts or Groups, which you may need to exclude time to time when sending sms from computer. 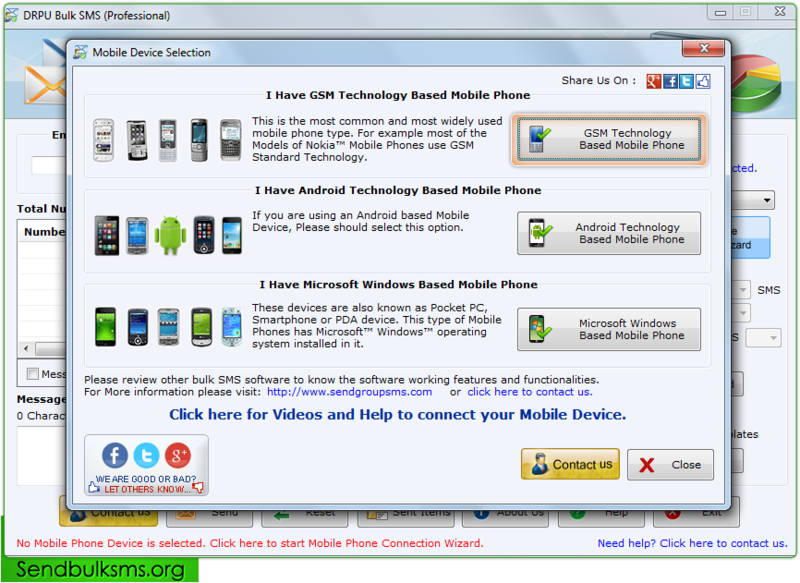 Step1 : Click on “GSM Technology Based Mobile Phone”, If you want to send group SMS using GSM mobile Device. Reliable way to broadcast sms from PC to user`s mobile phone. Send both standard sms and notification according to user's needs and requirements. Advance option to skip duplicate number entries. Import or load contact number from phonebook for sending bulk SMS. Application provides option to add or paste contact numbers manually. Via connecting android mobile device send bulk SMS in single shot execution mode.